Hard Rock in Atlantic City has been among the earliest properties to go for a sportsbook but Hard Rock Biloxi isn’t far behind! Both properties are working on getting Hard Rock Sportsbook up and running. 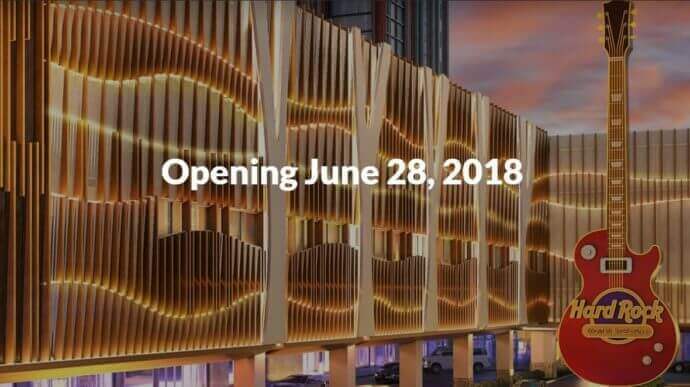 With the Hard Rock Atlantic City launched with a huge bang on the 28th of June 2018, much speculation surrounds the opening of a Hard Rock NJ Sportsbook via the new sports betting regulations the state has implemented. Who will Hard Rock Resorts partner with to create a sportsbook? Now, we have an answer. Hard Rock Atlantic City, NJ Hotel and Casino will be partnering with some of the top sportsbooks in Europe, rumors are that partnerships with Bet365 and Kindred Group are in the works. The Supreme Court decision to allow states to regulate their own gambling industries has left open the possibility for the Hard Rock Casino and Resort to incorporate a Sportsbook similar to their operation in Las Vegas. Like neighboring casinos in New Jersey, such as Oceans Resort which has already confirmed the addition of a Sportsbook, the Hard Rock Casino in Atlantic City, NJ jumped at the chance to launch their own platform. A Hard Rock Sportsbook Mobile App will also likely be available to bettors in NJ, giving them the opportunity to bet on the go as long as they’re physically located within the state. For a full review of the Hard Rock NJ Sportsbook and Hard Rock NJ Promo Code, read below. Bettors must be over the age of 21 to bet at the Hard Rock NJ Sportsbook. All bettors must be geolocated in New Jersey to place wagers. Bettors must create a Hard Rock NJ Betting Account before taking part in a bonus. A minimum deposit will activate the bonus. A Hard Rock Promo Code will most likely be needed to be entered during the registration phase. Wagering requirements must be fulfilled before funds are withdrawable from an account. Claiming your bonus online at the NJ Hard Rock will require you to make a Hard Rock Betting Account. This will most likely be via CG Sports Technology which already powers the online platform for their Vegas Sportsbook. To start the process, you should be ready to download the CG Sports App. Make sure you get the correct version, iOS or Android. After downloading the app, you may sign up for an account. Be sure to apply any Hard Rock NJ Promo Code during the registration process to make sure you don’t miss out on any Welcome Bonus. After you have successfully signed up for an account you may make a deposit which should activate the Welcome Bonus and trigger the promotional bonus in the form of bonus money or a free bet. It is expected that access to the Hard Rock Sportsbook can be with a browser-based client as well as a mobile app as long as you’re in New Jersey. Currently, the Hard Rock Mobile App is powered by CG Sports, and they’re also likely to power this most recent sportsbook addition. To download the CG Sports App users may visit the iTunes and Google Play stores. Hard Rock is known for providing its bettors with a wide range of sports and leagues to choose from, spanning the whole globe. But of course, big-time US leagues will be the primary draws. Expect tons of betting opportunities in the NFL, NBA, NHL, and MLB. But don’t forget about track sports either, horse races and greyhound races will also be available for betting with coverage of each race available at the Hard Rock Casino in NJ. Soccer, Rugby, Cricket, and Tennis betting opportunities will be made available, especially for large tournaments, for the bettor that follows foreign sports or athletes. Alongside the Hard Rock NJ Sportsbook, an online casino will be powered by GiG. GiG may not have any experience inside The States, but they boast a long resume of successful online casino around the world. Expect software from top online casino slot providers such as NETENT, giving users access to popular titles in the videoslots, table games, and video poker categories. A live casino might also make its way into the casino and give gamblers some interaction with a live dealer via a video stream. The Hard Rock Sports Book New Jersey is expected to have a wide variety of promotional incentives. Many incentives will come in the way of daily odds boosts and coupons for select sports. Seasonal and long-term promotions may be offered from the outset. There will be the chance to earn bonuses and free bets the more one wagers on the platform. A VIP program and loyalty points system will probably be in place for avid bettors. To keep up with all the promotions available at the Hard Rock Sports book New Jersey after it opens, be sure to visit the promotions page at the Hard Rock website. While it is still unclear if the online version of Hard Rock NJ will launch with the land-based casino on the 28th of June, the eventual addition of a Sportsbook is highly likely. With an existing online sportsbook section in the Vegas Hard Rock Casino and the addition of sports betting regulation in NJ, Hard Rock Casino has all the infrastructure needed to bring a Sportsbook to the Garden State. Don’t forget that a Hard Rock NJ Promo Code is expected to be available in the near future, just before the sportsbook launches to pump up interest. The code should give new bettors the chance to take part in a Welcome Bonus which will come with some extra bets or bonus money to get started. Make sure you don’t miss out by following all developments on the Hard Rock Sportsbook NJ on their website by clicking on the following link.